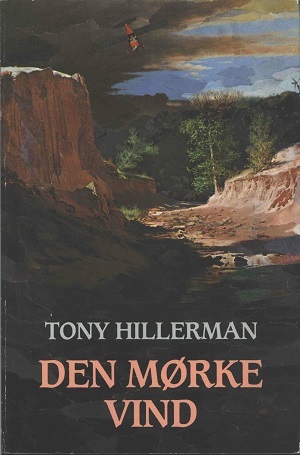 The Danish edition of Tony Hillerman's 1978 The Dark Wind, the fifth novel in his Navajo Detective series. This edition was published in paperback, and the original text was translated from English to Danish by Søren K. Barsøe. The cover art was created by Nils-Ole Lund. Format: Paperback, 21.5 x 14.3 cm. Binding: Paper covers with cover art that depicts a plane descending over a cliff. Tony Hillerman is printed vertically in light grey on the spine, and title and publisher's name printed vertically on the spine in light pink.